Art projects, puzzles and games help children learn about the backyard crawlies they adore. About LYNN RANSFORD (Author) : LYNN RANSFORD is a published author of children's books. 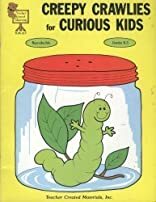 A published credit of LYNN RANSFORD is Creepy Crawlies for Curious Kids.